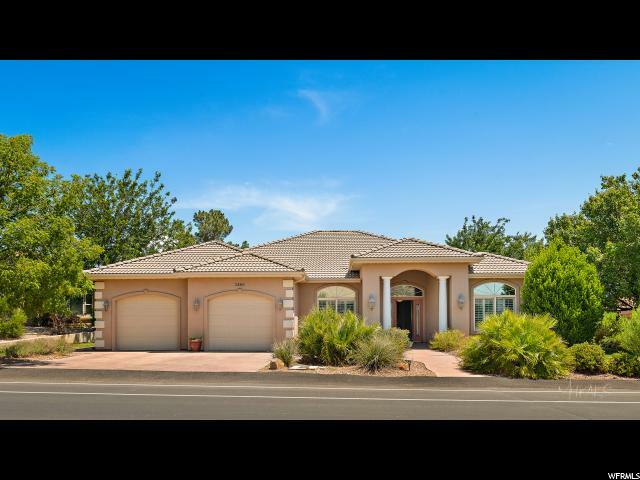 All BLOOMINGTON CC homes currently listed for sale in St. George as of 04/23/2019 are shown below. You can change the search criteria at any time by pressing the 'Change Search' button below. "From the moment you walk in, this will feel like home. Beautiful details are throughout this home, from the soaring ceilings to the coffered dining room nothing has been over looked. When you walk in you look directly through the window of the 4th hole of the Bloomington CC golf course, as you walk further you will find lovely formal dining and living areas. The kitchen is stunning as it opens onto the large family room with a beautiful gas fireplace, perfect for family gatherings. The master bedroom and bath won't disappoint, and neither will the huge custom closet. The basement has a wonderful place for kids to play and 2 bedrooms with a Jack and Jill bathroom. Plenty of storage in 2 huge storage areas. The covered patio is a beautiful place to relax and watch the golfers or the variety of wildlife that drop by. This house is just waiting for a new family to call it home."